Greyhound poisoning occurs more frequently than most other dog ailments. Before buying a product to kill bugs, crab grass or weeds read the label. Make sure you keep all caustic products in a safe and secure place—away from the reach of children and pets. So many times we hear about dogs ingesting antifreeze and becoming very sick or dying from it. If you find your dog licking the antifreeze container you must immediately get them to purge the substance. You need to get them to vomit by pouring some household hydrogen peroxide, the 3% solution, immediately in their mouth. One tablespoon for every ten pounds of weight should do the trick. Just grab their muzzle and pour in right down their throat, do it outside because this is very quick acting and they will bring up all that is in their stomach. If they don’t vomit right away wait ten minutes and give another dose, but no more than three doses as the peroxide can be dangerous if too much is given. The ‘over the counter’ remedy, syrup of ipecac, which some parents give to children to induce vomiting is safe for humans but is toxic to animals—NEVER USE THIS ON YOUR DOG. Should greyhound poisoning occur because your dog ingested some substance which is acidic such as lye, drain cleaner, gasoline or kerosene you should not induce vomiting. Remember if it burns going down it will burn coming back up. The last thing you want is to cause more damage to their throat and mouth. Give the pet something to neutralize the effect of the poison such as a few teaspoons of vinegar or lemon juice. Equal amounts of this with water should help soothe the stomach. Some toys have batteries and dogs have ingested battery acid by chewing on this type of toy. Immediately give Milk of Magnesia to counter act the effects of the acid, about one teaspoon for every five pounds of weight. You can also give some activated charcoal to absorb the poison. This can be purchased as a tablet or a powder. It will neutralize the poison in the stomach. Milk is also a good neutralizing agent. Only use these methods if the dog is fully alert, if they are at all drowsy do not try and force liquids. You don’t want to have it enter the lungs which will do more harm than good. In any event CALL YOUR VET IMMEDIATELY. Some states have poison hotlines for animals and it is wise to have those numbers handy in case of such an emergency. Chocolate is also toxic to your greyhound and is much more readily available in most households. There is a substance called theobromine in chocolate and if eaten by dogs in large amounts can cause greyhound poisoning. Baking chocolate contains a very large amount of this so be extremely careful when baking those holiday goodies. I want to warn about household plants which can be dangerous to pets. I have a cat who loves to chew on the leaves of my house plants so I am very careful about what plants I have around. Depending on your location there may be others common to your area which can also be toxic to pets. Check with your Vet or local Agricultural Department for a concise list. 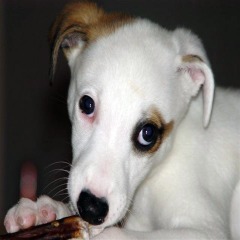 Common people medications and prescriptions can also cause greyhound poisoning. If this occurs immediately induce vomiting and call your vet. Keep sleeping pills, allergy medications, diet pills and all pet medications in a safe place. Always call your Vet or take your pet immediately to an emergency care center whenever any of these things occur. Time is of the essence when dealing with a greyhound poisoning situation, LOOK FOR WARNING SIGNS. CALL YOUR VET IMMEDIATLEY. Remember to save the poison, record the time of the incident and call the vet immediately.